If you insist on celebrating Equal Pay Day, just admit it's in name only. Because as late as 2011, 97 percent of full-time working women were in jobs that typically paid men more, an analysis by the Center For American Progress revealed today. Certain professions exhibit particularly drastic gender pay gaps. Take female chief executives, who earn only 69 percent as much as their male counterparts. These 245,000 female chief executives end up earning an average of $658 less per week than the 745,000 men in their profession. Indeed, of the 534 professions listed by the Bureau of Labor Statistics, women on average earn more than men in only seven of them, a group composed of 1.5 million working women, or only 3 percent of the full-time female work force. 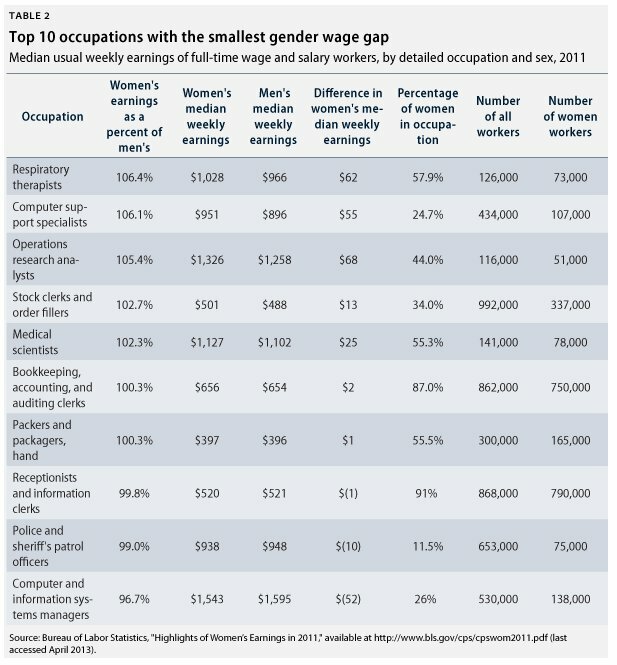 And even here, in the seven occupations that women do earn more, the wage difference is quite small. Female operations research analysts, for example, earn just $68 more a week than men with the same job -- almost 10 times less than the weekly wage gap between female and male chief executives. Sarah Jane Glynn, senior policy analyst at American Progress, told The Huffington Post that breaking out the wage gap by occupation debunks the notion that women are earning less than men nationally because of "choices they make." "When you break the data down like this, it is really hard to make the argument that women want to stay home with their kids and are choosing lowering paying jobs," Glynn said. "When you are talking about chief executives, for example, you can’t get there without a huge investment." Glynn attributes these stark numbers partly to women being less likely to negotiate starting salaries, a decision that can have long-term consequences, research has found. With now-ex-husband Steve, Elaine Wynn founded a casino empire that included The Mirage, Bellagio, Wynn and Encore resorts, among others.